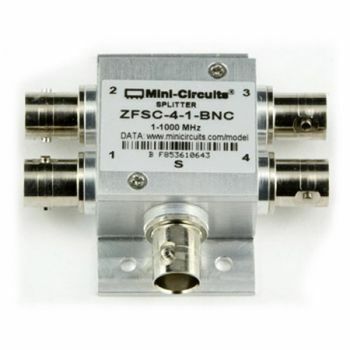 Four-way passive RF splitter, 1-1000 MHz, Isolation dB (Lower=25, Mid-23, Upper=20). Loss at each output dB (L=6.4, M=6.6, U=7.6). Identical to MiniCircuits model.